Call us now for a fresh, piping hot, custom-made flavourful pizza. Some days it’s easy to cook dinner on your own, and other days you want nothing more than to sit back, relax and have someone else to prepare dinner for you and your family. On those days, let Cosmos Pizza & Pasta be your chef! With delicious options like pasta, wings and pizza in Greater Victoria, you’ll be glad you chose us. Cosmos 2 For 1 Pizza & Pasta is family owned and operated. Located in the Stadacona Centre at the Oak Bay Junction of Fort, Pandora, and Oak Bay Streets, we’ve served Greater Victoria since 1996. We’re not affiliated with Cosmos on Tillicum or Burnside. The pizza options at Cosmos 2 For 1 Pizza & Pasta are second to none. Our menu is home to the basics like plain cheese for your children, the classics like sausage and pepperoni for those favouring traditional flavours as well as our own specialty pizzas for those looking for a little adventure. You also have the option to create your own pizza at any size, allowing you to find the perfect balance of cheese, sauce and toppings. At Cosmos 2 For 1 Pizza & Pasta, every dish is made with love. If you’re not in the mood for one of our homemade pizzas, our menu is full of other delicious Italian options! Order our homemade pasta with meat or tomato sauce to satisfy your hunger or choose a healthier option like our Caesar salad. You can go for a money-saving option with our specials like Cosmos Packs that let you get a little bit of everything. We also have combos that will be enough to feed a small family. If one entrée isn’t enough, you can complement your meal with a delectable side order such as BBQ wings or breadsticks. The decision is up to you! Whether you’re feeding 5 or 15, our pizzas and pastas are a great meal option perfect for sharing. Give us a call and we’ll have your order ready to take home to enjoy with your family or friends. Our favourite thick crust-style, takeout pizza in Greater Victoria. Totally loaded with toppings, crispy crust, and well- priced. We live nearby and pick up ourselves; this pizza is reliably ready when they say it will be, hot, fresh, and delicious. Definitely not thin crust, but very good for a thick-crust pizza; the vegetarian is the best pizza I have ever tasted [and I'm not vegetarian!]. We have served this to people from Nanaimo and Calgary, and they have commented on how great it is. Our go-to for takeout pizza, for sure. Never had a bad pizza from this store! Actually all the pizzas we have ordered have been well made! Delicious. Amazing. Hot. Cheesy. Proper. Bang for your buck. Amazing staff and management. Top-quality food. Awesome pizza at this specific cosmo location. Got the meat lovers. Wow was it good. Wish the one downtown was this good. The best pizza in town. Great customer service and fast delivery/pickup. Never experienced a bad meal. We've been ordering from Cosmos for almost a decade. Perfect every time. They say it's ready in 45-50 [minutes], they deliver in 25-30 mins. Outstanding quality and timely service that can't be beaten. Whenever they're closed and we've ordered from other places, we are always dissatisfied and want Cosmos. 10/10! Call for a free delivery, or get 10% off when you pick up your order (minimums apply). Whether you need spaghetti, lasagna, ravioli or tortellini, we’ll make it your way. 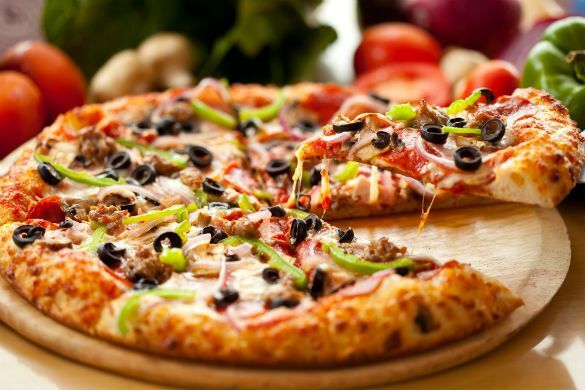 Chicken, beef, salami or shrimp, call us today to order your choice of pizza. Our salads are seasoned with the right ingredients to make them fresh, juicy and crisp.